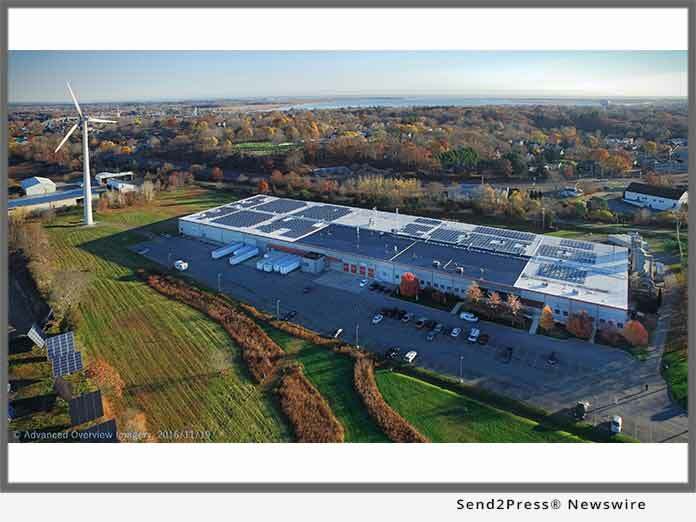 NEWBURYPORT, Mass., May 02, 2018 (SEND2PRESS NEWSWIRE) -- The recent addition of Mark Richey Woodworking's 500-kW solar array marks the company's place as one of the greenest architectural millwork firms in the U.S. Mark Richey Woodworking (MRW) is a national model in manufacturing with the continual use of its 600-kilowatt wind turbine and solar array allowing the 130,000 square foot facility to operate entirely from renewable energy. Most recently, MRW received a state award as an industry champion for its exceptional efforts to reduce pollution. Its unique biomass furnace - which heats the entire shop - achieves a 73% reduction in solid and universal waste generation according to the Toxic Use Reduction Institute (TURI). One of the most unique aspects - and there are many - about the corporate culture of MRW is that Mark Richey sets the bar so high when it comes to sustainability that it is not unusual to find the accomplished mountaineer - who summited Mt. Everest in 1991 - comfortably situated at 290-feet above sea level cleaning the wind turbine himself. Mark Richey and his wife Teresa founded MRW nearly 40 years ago and have always incorporated their renewable energy goals into its growth. Opening its doors for tours for school children and businesses reinforces the company's environmental commitment that has become a beacon for sustainable manufacturing. "If a small manufacturing company in Newburyport, Massachusetts can do this so can the larger companies. Our hope for youth is that when kids are my age, sustainable manufacturing will become the norm and not the exception," said Mark Richey. Mark Richey Woodworking crafts and installs custom architectural woodwork. Our work enhances the experience of performing arts centers, museums, corporate headquarters, academic institutions and restaurants across the country. For more information go to https://www.markrichey.com/ or write to pfullerton@markrichey.com or call (978) 499-3800.